Details: Nickel chloride is the same as nickelous chloride and nickel dichloride. 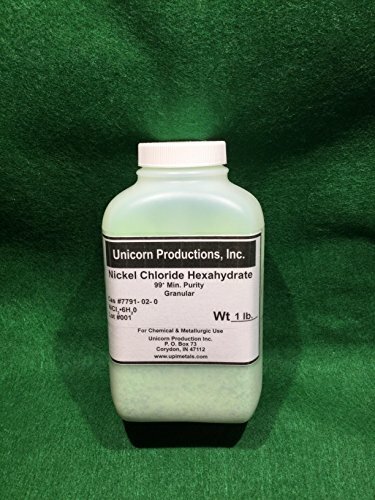 This nickel chloride hexahydrate is ground to a free flowing yellow-green crystalline granular form and packaged for sale in a high density polyethylene bottle suitable for a laboratory shelf. It is not shipped in baggies. This material is deliquescent! If not kept in a tightly sealed bottle it will absorb moisture from the air until it forms a pretty green solution. It is listed by some agencies as a suspected carcinogenic substance so please use care in handling. It is used in pottery as a colorant, in electroplating nickel coatings, and for the manufacture of relatively sulfide free nickel catalysts. The anhydrous form is used as an absorbent for ammonia.